I browsed through the Nielsen Wire’s report on smartphone users with focus on iPhone vs Android and found this chart intriguing. 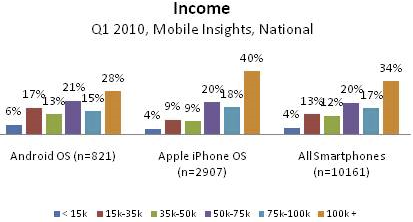 The iPhone audience is not only much bigger, it is also much richer than the Androids’. What kind of surprise me is that the Android is behind the average in this measure. Steve Jobs has definitely captured the best audience out there. Head over to Nielsen Wire to read the full report.